The Gun Brewery made its debut at the 2015 Eastbourne Beer Festival with its Zamzama IPA and two of that beer’s stable mates. It duly won the Sussex Microbrewery of the Festival, with Gun’s Parabellum Milk Stout as runner up. 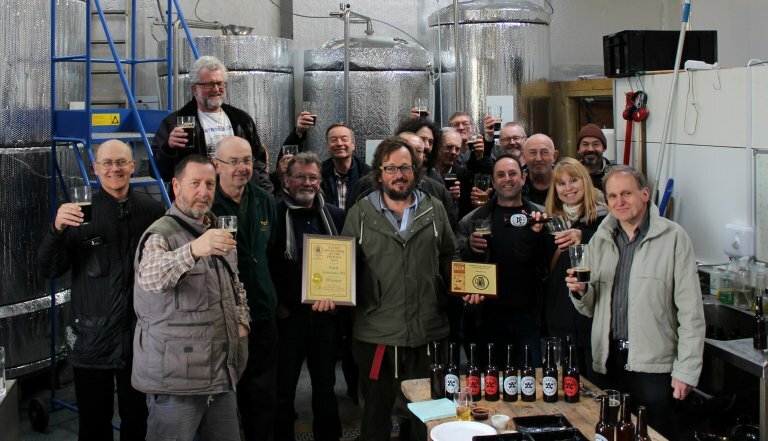 In March 2016 a full minibus of branch members, for which thanks to Nick for driving, made the trip to the brewery to present Toby of the brewery with the award. We were welcomed most hospitably with the winning beer on cask and bottles of the other brews opened to provide variety. As most present had visited the brewery previously, rather than a tour Toby outlined for us how he saw Gun developing in the future. The picture shows Toby (centre) with the awards, Steve Obey the Brewery Liaison Officer on the left with branch members in attendance.